Current climate conditions do affect animals as well as people. As a dairy farmer it is very important for you to have a plan for your dairy cattle stress management. How and when you have a plan, the sooner you can address the symptoms and as well the sooner your cattle can get comfortable and get back to producing milk properly. To make sure you are doing your best, offer them fresh water at all times and make sure they have extra during the summer, when their body’s fluids are leaving them quicker. Using a stress management tool such as a Kestrel Data Logger can help you in knowing when you have condition changes that will be a problem for you. Say for example, the water’s temperature throughout the day has increased in tandem with the outside temperatures, and is too warm for the cow’s body. This will effect the cow’s milk production, so you don’t want that happening. An alert setup on the Kestrel data logger will alert you to these changes. Setting up sprinkler systems over the feeding areas can also help reduce heat stress in your cows. If you have a large operation, you will need to address this issue and install them so that the entire population of cattle can receive the relief from the sprinklers. Watch how the cattle react to high-temperatures. The alerts from the data logger will alert you to climbing danger situations. You may want to install barn fans so that air will move consistently through the open sides of the building. Some barns are made of concrete so opening the lower level of the barn is not possible. In these cases add the fans above the cattle and this will help resolve the matter. For barns with sheet metal walls, remove the sides of the metal and install netting in place of the metal. This netting can be lifted to improve air flow during the summer and you can easily lower it during the winter. Another option is to add or increase the ventilation in the roof. When cattle are outside, be sure that they have ample places to shade themselves. 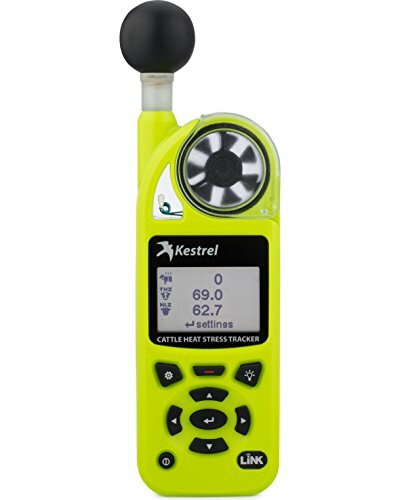 Kestrel manufactures a small monitor device (the Kestrel Drop) which works very well for giving you many different weather related readings that are very useful in managing the heat stress in your cows. This monitor is a data logger that measures traditional weather parameters of ambient temperature, relative humidity, heat stress index, dew point temperature, as well as Temperature-Humidity Index (THI), a livestock specific heat stress calculation. The Kestrel DROP allows users to customize logging rates, connections and alerts. Another great feature is that it is dust and waterproof which is absolutely necessary to be able to continually work in harsh farming conditions. You will be informed of heat conditions in the barn, during transport, or anywhere livestock are housed. This is also well used in with heat stress feedlot cattle management. Large beef cattle farms today will be using large fenced in acreage to just feed the cattle each day. The problem today is that the cattle are kept for days during the nice weather season in these feedlot conditions, so without a heat stress monitor you wouldn’t know when to move the cattle to a cooler spot. Other methods for increasing the nutrients the cows get to improve their condition include feeding them more grain, fats and high-quality forage. Do not forget that when they perspire and pant they lose a lot of water. While drinking water helps replenish moisture, it cannot replace essential minerals. These can be dealt with by increasing potassium levels in the dry food. You will want to increase sodium and magnesium levels slightly. Cows may experience a decline in rumination when their forage is of high quality. As long as you add buffers, this should correct the problem. The proper buffers will maintain pH balance and better, more consistent milk production. The latest developments are focusing on making use of genetics to breed cows that are more resistant to heat. Already some cattle are more capable of experiencing less heat stress. Genetic studies could make breeding the cows with better tolerance with other cows more common, resulting in animals that are naturally resistant to heat stress. When the weather is hot and humid always increase the number of feedings. Try feeding them early in the morning or later on at night so that they can eat when temperatures are likely to be more comfortable and will lead to less feed heating which causes spoilage. This also keeps flies to a minimum. Keep observing the cows as needed to adjust feedings and make any changes to the barn to facilitate cooling. For specialized help, consult with your feed consultant but following the above tips should help your dairy cattle stress management. As you can see the heat stress in cows can be made a controllable situation using the proper plan. The plan would included dietary planning, and heat management plans for watching and changing where your cattle are currently residing. If it is in an barn situation have one plan. If it is a heat stress feedlot cattle situation have a plan for that. Move them to a shaded pasture area possibly, but don’t just keep them in an open feedlot. The heat stress in the cow feedlot must be maintained, to ensure normal steady milk production from your cows. So use the tools that are available to help you out. Continue your farming activities but still be alerted to the changes that are happening from minute to minute and hour to hour. Dairy cattle stress management is to be taken seriously. Discussion of heat stress levels for cows & involving feedlot cattle. Weather tools are helpful and you will find to be irreplaceable once you start using them.